Thanksgiving Cactus is a member of the Cactaceae family. Schlumbergera truncata is the parent of many hybrid Schlumbergeras. In its native habitat, this rain forest cactus is epiphytic, making its home on trees. 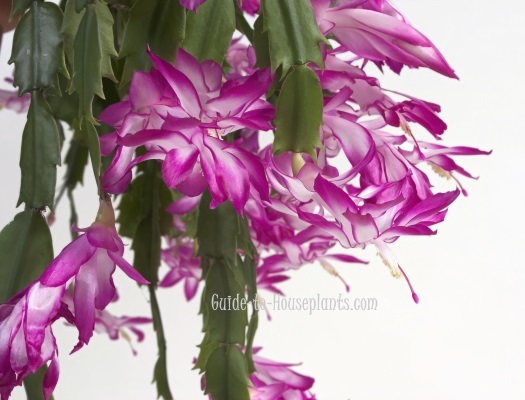 Vibrant, bi-color blooms make Thanksgiving Cactus a must-have houseplant. Some misconceptions exist about how to grow this tropical cactus. Don't treat this holiday bloomer like its desert relatives. Consider Schlumbergera's native habitat, were it's perched on a tree branch in the South American jungle...under the canopy of tall trees and vines...bathed in high humidity. Give your plant what it wants, and you'll enjoy it for many years. Some people tell me they've had their Schlumbergera truncata for a few decades. 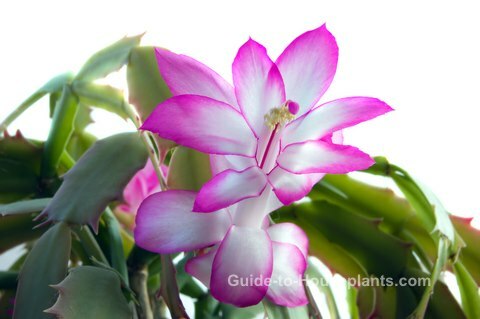 This is a relative of the Christmas Cactus, which likes the same tropical treatment. 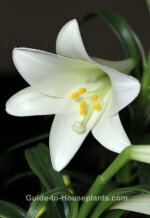 You can identify its Christmas cousin by its smooth, scalloped stems and later bloom time. Thanksgiving cacti have toothed stem segments that are long and narrow, connected by a mid-rib. Its deeply indented stems look like crab claws, giving it a second common name, Crab Cactus. In late fall, this tropical cactus bears big, beautiful flowers, which may be red, pink, peach, orange, white, or bicolored. 'Peach Parfait' and 'Twilight Tangerine' have peach and orange blossoms, respectively...'Red Radiance' is dark crimson...'Majestic' is purple. 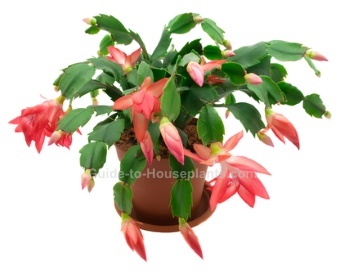 Keep your holiday cactus in front of a bright, cool window while it's in bloom. Cut the stem off between segments (the place where they're joined together by a midrib). Use sharp, clean pruning shears to prevent tearing the stems. You'll get a fuller plant by pruning. Cutting it back in spring will encourage the plant to branch out where the stem was cut. Flowers emerge from the ends of the stems so you'll get more blooms this way. Spring is the best time to prune it back, when it begins actively growing again. Don't toss those cuttings -- propagate them for more plants. How to get the blooms. Flowering results from shorter, cooler days for 8-10 weeks. Putting your cactus outdoors in early fall is ideal. Be sure it's in a shaded location. Bring it back inside before the first frost. Once buds set, don't move the plant around. Flower buds are likely to drop off if the plant is moved or suddenly exposed to temperature changes. If this happens, don't worry. It will bloom beautifully next year. Late bloomer? Thanksgiving cactus plants are brought into bloom by greenhouse growers to sell before the holiday. You can depend on your plant to flower freely every year, but don't be surprised if it doesn't bloom on schedule after the first year. 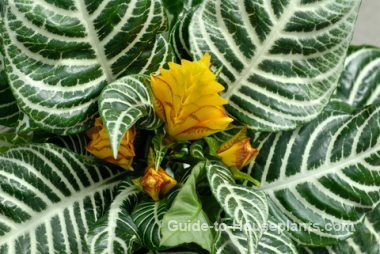 Flowers may appear a little later in the season than when you purchased your plant. Water: Keep the soil evenly moist, but not soggy while plant is growing. After flowering, water sparingly until new growth begins in spring. Stems will shrivel or wilt if the roots are too dry. Humidity: This jungle native does best with moderate to high humidity, preferably 50% or above. Check out these tips for raising the humidity for your tropical plants. Fertilizer: Feed every 2 weeks with a balanced liquid fertilizer diluted by half. After blooms have dropped, stop fertilizing until new growth begins in spring. Propagation: Take stem cuttings (2 to 3 attached segments) in spring or early summer. Allow the cut ends to dry for a day; they'll form a callous where they were cut to prevent sap from oozing. Then place stems upright (the same direction they were growing) in moist perlite.